If you give a mom a snooze button, she'll use it. If she uses the snooze button, she'll run late. If she runs late, the kids get granola bars for breakfast. If the kids get granola bars for breakfast, they'll leave crumbs in the car on the way to school. If the kids leave crumbs in the car on the way to school, mom will have to clean it. If she has to clean the car—she won't. It's a minivan, not a wedding limo. It's like the crumbs have come home. You're home, crumbs! Welcome home! Just chill with the stale French fries and that sticky goo in the cup holder. If a mom cleaned up crumbs from every damn thing the kids ate in the car, she'd have to care. Mom doesn't care. Mom hasn't had enough sleep to care since the doctor said "Push!" and she said to your dad, "I will end you if you try to tell me to breathe through this." If she had been able to breathe through childbirth in a way that nullified pain, she'd be some kind of super hero, like Wonder Woman but not in a Jane Fonda leotard that got dressed up for the Fourth of July. Think Wonder Woman in jeans and tee shirt and a minimizer bra. And she'd use her powers to get to the school to volunteer, or get to the grocery store for milk, or get to work to make money to pay for more granola bars, or get back home to vacuum the living room because screw the car. If she had the energy to do all of that volunteering and grocery shopping and job having, she'd save the last of it to help the kid that hops off the bus and announces a last-minute project he never mentioned and she'll stay up long after they go to sleep using a blow dryer to dry the volcano her son couldn't finish. Once that's done she'll clean something or pack a lunch or match socks or maybe none of the above. If none of the above, she'll just pour a second (or third—volcano drying is thirsty work) glass of wine and catch up on her shows because none of these damn socks have matches, anyway. If she can't match socks, she'll try to sleep, but won't shut her eyes until midnight, and even then they'll pop back open because wasn't there a permission slip she needed to sign or a check she needed to write and good lord, what's that smell? How long has that one load been in the washer? If, after shuffling into the kitchen to find the checkbook or into the laundry room to sniff the musty towels before deciding to rewash the whole load, she has any awake left in her, she'll lay in bed and mess around on her phone until very late, but, hey, she stays up late every night. 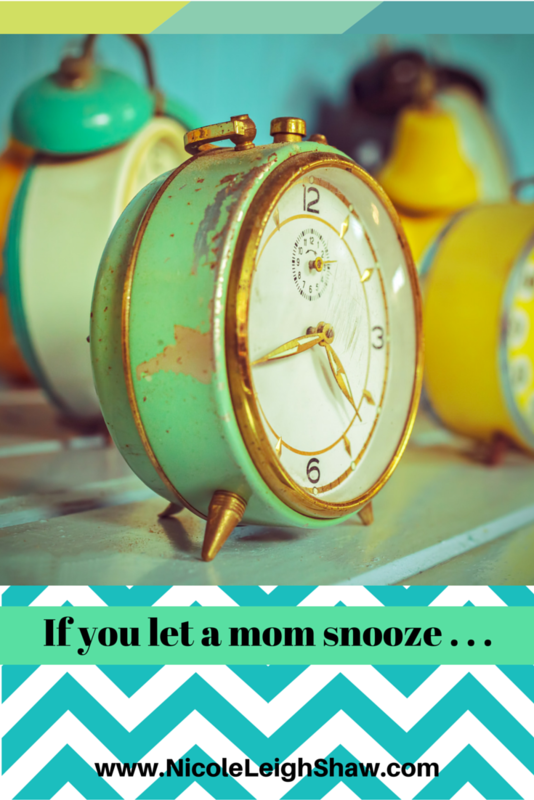 And if she stays up late, chances are she'll use the snooze button in the morning.